Taking bits from several online recipes, we created this brilliant soup for a family buffet meal before a joyous family wedding. We doubled the recipe, making just over 1/2 gallon of soup, and had more than enough to serve 16 people. We served two versions of the soup. We poured half into small glasses, and then added sour cream and vanilla to the second half before pouring this pinker version into another set of small glasses. 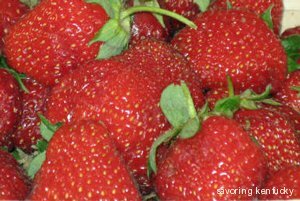 The non-dairy version has a bright, intense, sweet-tart strawberry richness. The dairy version is more mellow and sweeter, and the tiny amounts of spice seem to come forward a bit. Our guests applauded both versions, and we liked the ease with which we could accommodate dairy intolerances and still provide two wonderful soup options. Place all ingredients in a food processor fitted with a flat blade, and process on medium for 4-5 minutes, or until the consistency is as you like it. Taste, and adjust the sweet/tart ratio as needed with a bit more sugar or lemon juice. If you want, you can make the soup thinner by adding a bit more apple juice. Pour into a glass container and chill thoroughly, at least six hours. Serve in small glasses as is to start, punctuate, or end a large meal. Excellent starter soup for people with lactose intolerance. Add 1/2 cup sour cream, Greek yogurt, or strained whole milk yogurt and 1 teaspoon vanilla. Blend thoroughly. Instead of 1/2 cup apple juice, use 1/4 cup apple juice and 1/4 cup good rosé wine, or to taste. For a smoother texture, use a blender instead of a food processor. You may need to work in two batches and stir the results together. You can also capture some of the strawberry seeds by straining through a fine sieve. Try a bit to see whether your soup and your sieve work well together.